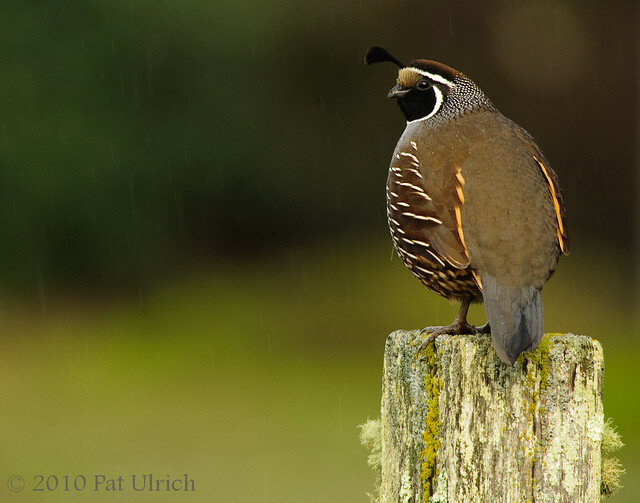 A male California quail watching over his family group near the Bear Valley Visitor's Center in Point Reyes National Seashore. This is a fun time of year to see quail (although they weren't too keen to see me), since the family groups are really quite large. I would guess there were at least 25 birds in this flock that was scouring the grounds near the visitor's center parking lot. As soon as they saw me from across the road though, they disappeared into the shrubs. It was pretty amazing how easily they faded into the landscape that was just in front of me. This lone male was watching over the proceedings from a high perch (a fence post in this case), which I have often seen them do. Perhaps it is a trait of nobility evident in our state bird. As for the shot, the conditions were clearly not ideal for photography, with heavily overcast skies and even some drizzle. I was happy to get at least this sharp frame out of the bunch though, since I'm a big fan of birds sitting on cool old fenceposts. I also love having some of the drizzle visible in the frame, although my camera may beg to differ. It's interesting to see how far a tiny raindrop can fall in 1/125 of a second!